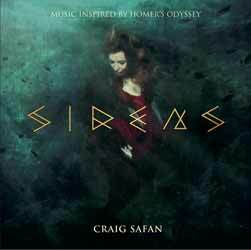 Craig Safan is a composer whose music to The Last Starfigher (1984) has always been a favourite of mine. Freed from the constraints of composing for a movie, I was looking forward to see what he would unleash. The results are truly magical. The project contains 13 tracks (54 min, 08 sec) and in places I was reminded of Penka Kouneva's wonderfully rich concept album A Warrior's Odyssey. I'd strongly advise you to not read the sleeve notes and instead soak up the music, as its presented, at least a few times before heading on over to discover the setting and inspiration for each piece. It's a rich and deeply layered collection of tracks. It's great to hear something that is original coming from Safan that sidesteps the usual constraints of writing for someone else's project. The album concludes with arguably the most memorable, and certainly the most moving, 'Icarus (For J.H.)' which really does leave you wanting more.